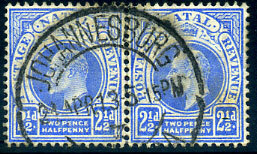 interprovincial use in blue ink dated 5 APR 1911 with indistinct numeral at base (possibly 6) on KE7 1/- (SG.151) piece. 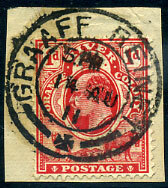 interprovincial dated 8 AUG 12 on CGH KE7 5/- (SG.78, Cat.£28). 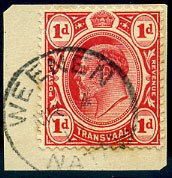 (CDS) interprovincial use dated MR 7 13 on Transvaal KE7 1d (SG.274) piece. (CDS) interprovincial use dated B/FE 10 13 on TVL KE7 1d (SG.274). interprovincial used dated SP 4 11 on ORC KE7 1d (SG.149). interprovincial dated 5 JUL 11 on CGH KE7 4d (SG.75). 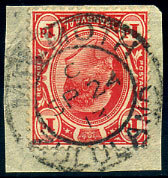 interprovincial use dated AP 9 12 on block of four TVL KE7 6d (SG.266). interprovincial dated 5 DEC 12 on TVL KE7 1d. Railway Office interprovincial dated 13 DEC 10 on vertical pair CGH KE7 ½d (SG.70) piece. 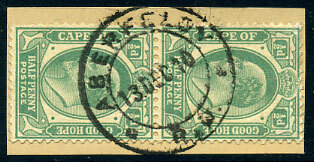 interprovincial dated JU 13 11 on CGH KE7 6d (SG.76), minor toning. interprovincial dated C/MR 2 11 on horiz. pair CGH KE7 1d (SG.71), blunt corner perf. interprovincial dated MR 23 11 on CGH KE7 1d (SG.71) piece. interprovincial dated A/JA 24 11 on horiz. 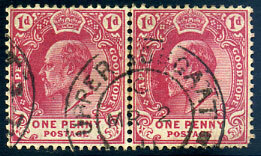 pair CGH KE7 ½d (SG.70) piece. interprovincial skeleton dated SP 18 13 on horiz. pair TVL KE7 2d (SG.275). 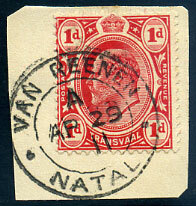 interprovincial dated 14 JUN 1912 on TVL KE7 1d (SG.274), corner perf. fault. interprovincial dated 27 MAY 12 on TVL KE7 1d (SG.274), facial toning. interprovincial dated 10 JAN 13 on TVL KE7 1d (SG.274). 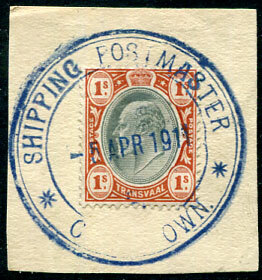 late interprovincial-type use part dated -- APR 15 on 1891 TVL QV 2½d (SG.113), unusual. interprovincial dated 24 APR 13 on horiz. 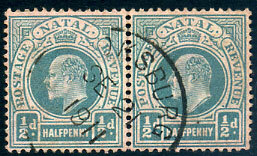 pair NTL KE7 2½d (SG.131, Cat.£11). interprovincial relief cds dated SE 21 11 on horiz. 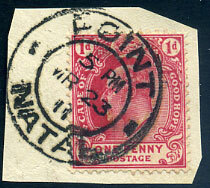 pair NTL KE7 ½d (SG.146), soiled colour. interprovincial dated 18 AUG 11 on horiz. pair NTL KE7 1d (SG.148). 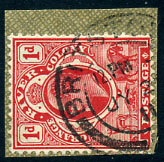 interprovincial dated 14 JY 11 on ORC KE7 1d (SG.149) piece. interprovincial dated JA 11 13 on horiz. pair ORC KE7 3d (SG.143). 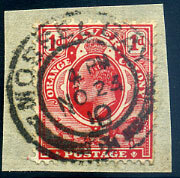 interprovincial dated NO 23 10 on ORC KE7 1d (SG.149) piece. 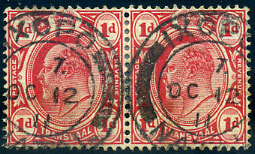 interprovincial dated 14 AU 11 on ORC KE7 1d (SG.149) piece. interprovincial dated JY 12 11 on ORC KE7 1d (SG.149). 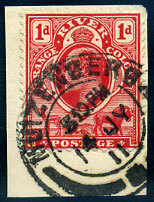 interprovincial dated JY 2 11 on ORC KE7 1d (SG.149) piece. interprovincial dated 8 DEC 12 on TVL KE7 1d (SG.274). interprovincial dated DE 7 10 on ORC KE7 1d (SG.149). 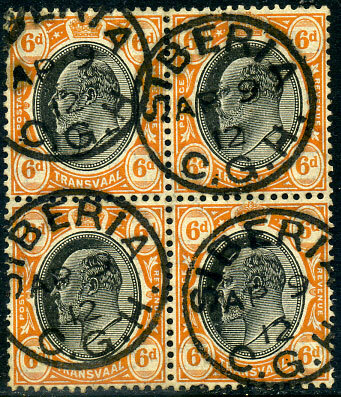 interprovincial dated A/AP 29 11 on TVL KE7 1d (SG.274) piece. 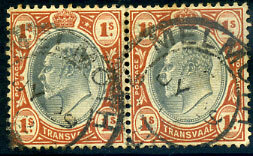 interprovincial dated MR 4 12 on TVL KE7 1d (SG.274) piece, slight toning. 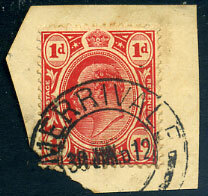 interprovincial dated DE 8 11 on horiz. 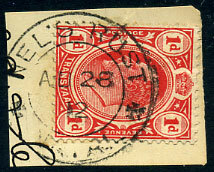 strip of three TVL 2d Postage Due (SG.D3). 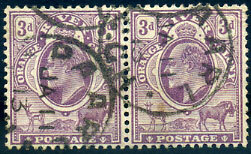 interprovincial dated OC 21 14 on vertical pair TVL 1d Postage Due (SG.D2). 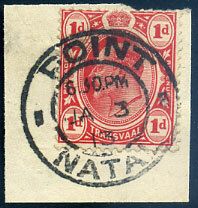 interprovincial dated C/24 JA 14 on TVL 2d Postage Due (SG.D3). 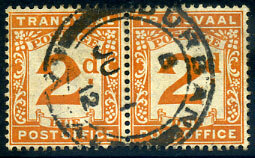 interprovincial dated FE 24 12 on TVL KE7 1d (SG.274) piece. 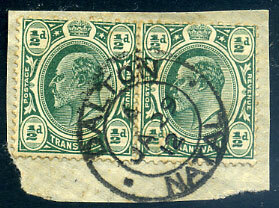 interprovincial dated JA 3 13 on TVL KE7 1d (SG.274) piece. 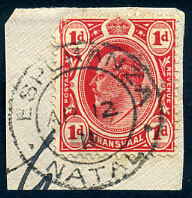 interprovincial dated C/SP 24 13 on TVL KE7 1d (SG.274) piece. 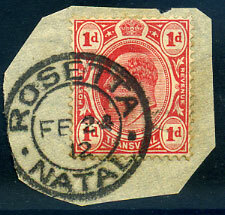 interprovincial dated C/JY 29 12 on horiz. pair TVL KE7 1/- (SG.267). 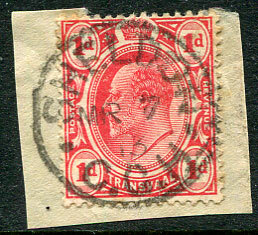 interprovincial dated 30 JUN 12 on TVL KE7 1d (SG.274) piece. 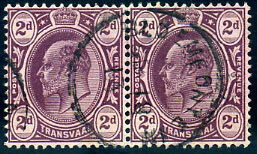 interprovincial dated AU 28 12 on TVL KE7 1d (SG.274) piece. interprovincial dated SP 7 12 on TVL KE7 6d (SG.266). interprovincial dated AP 12 11 on TVL KE7 1d (SG.274) piece, corner perf. defect. interprovincial dated OC 12 11 on horiz. pair TVL KE7 1d (SG.274), hinge secures perf. splitting at top. interprovincial dated MR 21 12 on TVL KE7 1d (SG.274). interprovincial dated OC 11 12 on TVL KE7 2d (SG.275). interprovincial dated B/JU 1 12 on horiz. 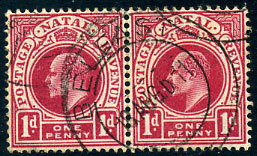 pair TVL 2d Postage Due (SG.D3). interprovincial dated A/JA 29 12 on horiz. 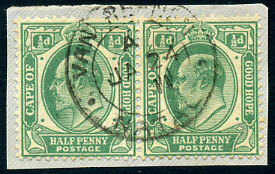 pair TVK KE7 ½d (SG.273a) piece.